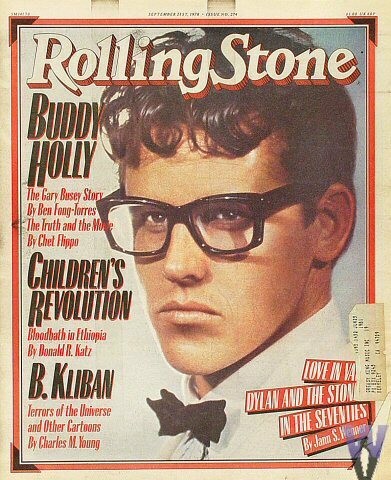 Buddy Holly was perhaps as big a guy as any the music industry has ever seen, the fact that he died at the age of 22 didnt deter him from being a huge inspiration for the Holy Trinity of Rock, The Beatles, Bob Dylan and The Rolling Stones, although what it did was, we never got to hear much about this guy. Specially being part of a generation which is blooming more than 50 years after that february of 1959, when perhaps the most influential artist of a generation died in a plane crash. And as is befitting for a musician, the biggest tribute for him came from a guy in 1971 in the form of a song, which has enabled even me to discover and fall in love with Buddy’s music. The song although is about The Day the music died, that is when Buddy Holly died but he does tell us stories about many social icons of his age, what they were doing and what they were famous for. That this song is perhaps my all time favorite song and has play count more than twice of any beatles song, is a story of another post. 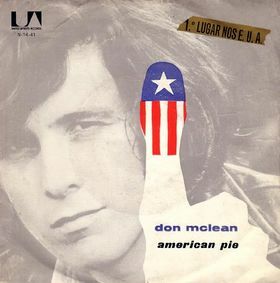 Few days back I wrote a post (unpublished )onthe song “American Pie“. The song, about the Day the Music Died. refers to the accidental death of 3 famous musicians, one more famous among the trio. A guy, most people in this generation wouldnt be aware of. Another fact, most of us arent aware of is, the inspiration this young man had onthe music of that decade as well as the decades to come. Thats why I thought of first writing about Who and What Buddy Holly was, BEFORE we pick up more serious questions of life and death. The Beatles, The Rolling Stones & Bob Dylan can perhaps thought to be the Holy Trinity of Rock music. You may as well consider Buddy as the God of Rock & Roll,sure the King of Rock & Roll was and will always be there. He may not have actually inspired most of the artists today. Most of them wouldnt have listened to him. But he is the forefather, we all have just heard or read about. He is the one who inspired Rock music. He is the one who begun Rock & Roll. Talking about the influence, he had on the holy trinity. The Beatles – Beatles had been a big fans of his, with both Lennon & McCartney citing him as their major influence (along side Elvis, without whom in Lennon’s words, there would have been no Beatles. The name Beatles was chosen partly as a homage to Buddy’s band, Buddy Holly and The Crickets. A cover of Holly’s was there in their first Album Please Please Me and even for the last Beatles Album Let It Be, a Buddy cover “Mailman, bring me no more Blues” was recorded, although not released in the album. The Rolling Stones – Keith Richard attended Buddy’s concert where he heard the song “Not Fade Away” and even they had a major hit with a cover of this song. The biggest challenge for Sam Phillips, the guy partly responsible for the beginning of Rock & Roll in the mid 50s, was the unification of the white (country/western, hillibilly) and black (blues, gospel)music of the times. Sam knew how important finding such a man was to him. And sure enough did it happen. Somewhere around 57 years back in time, world saw perhaps the biggest explosion in music since Beethoven. For the first time a real music star was born, a new kind of music culture of idol worship, there was a madness for the music and the artist both for the first time. The time of Rock & Roll had arrived and the world was gonna be a much happier place now. 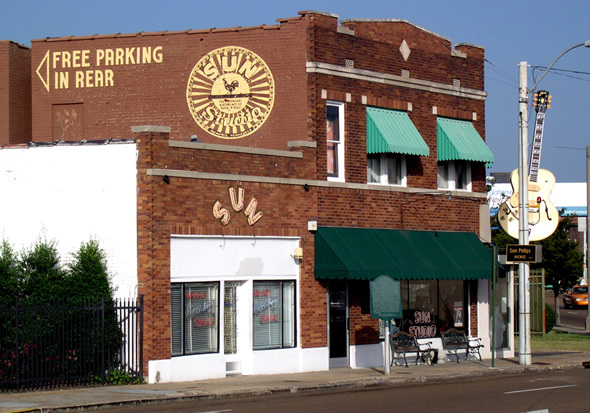 On July 18, 1953, still a teenager, Presley first went to the Memphis Recording Service at the Sun Record Company, now commonly known as Sun Studio. He paid $3.98 to record the first of two double-sided demo acetates, “My Happiness” and “That’s When Your Heartaches Begin.”. These were supposed to be a belated Birthday gift for her mother although his family didn’t own a record player at the time. Sometimes its also speculated that Elvis might have come their just with an intent to get noticed by somebody instead of just a simple giftfor his mother. 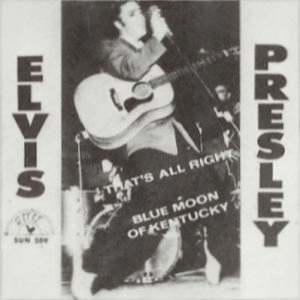 Blue Moon of Kentucky was recorded. And the rest as they say is history! Before the rolling stones started rolling, before the Who became the loudest band in the history of rock & roll,before the rise of Floyd, the arrival of queen . Before Beatles started The British Invasion . While Beatles were releasing Please Please Me in Britaian, there was an American band who was making lots of news across the Atlantic, known as The Beach Boys. In 1966, they came up with Pet Sounds. Arguably one of the best album of all time(Source ). Pet Sounds, at the the time of its release wasnt much of a success yet has been criticially acclaimed through the years after that. Pet Sounds was created several months after Brian Wilson had quit touring with the band in order to focus his attention on writing and recording. In it, he wove elaborate layers of vocal harmonies, coupled with sound effects and unconventional instruments such as bicycle bells, buzzing organs, harpsichords, flutes, the Electro-Theremin, and dog whistles, along with the more usual keyboards and guitars. This might do some justice to the album. 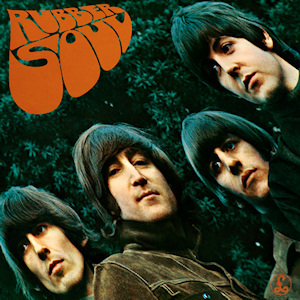 Rubber Soul, the Beatles LP released in 1965 had been the real catalyst to come up with perhaps one of the most influential music heard in rock history. 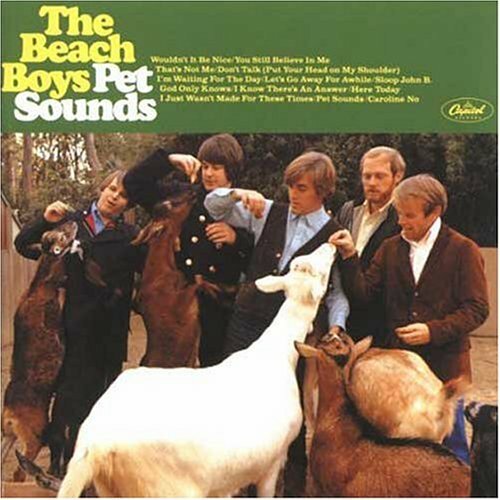 Yet Pet Sounds, by the virtue of its awesomeness (for which, The Beach Boys did have a charge) inspired many an artist. The biggest name of them was, none other than Paul McCartney of (Beatles?). The circle which was started by Brian Wilson which led to Pet Sounds was completed by The Beatles’ attempt to equal the album with what is rated by Rolling Stones(magazine) as the greatest album, Sgt. 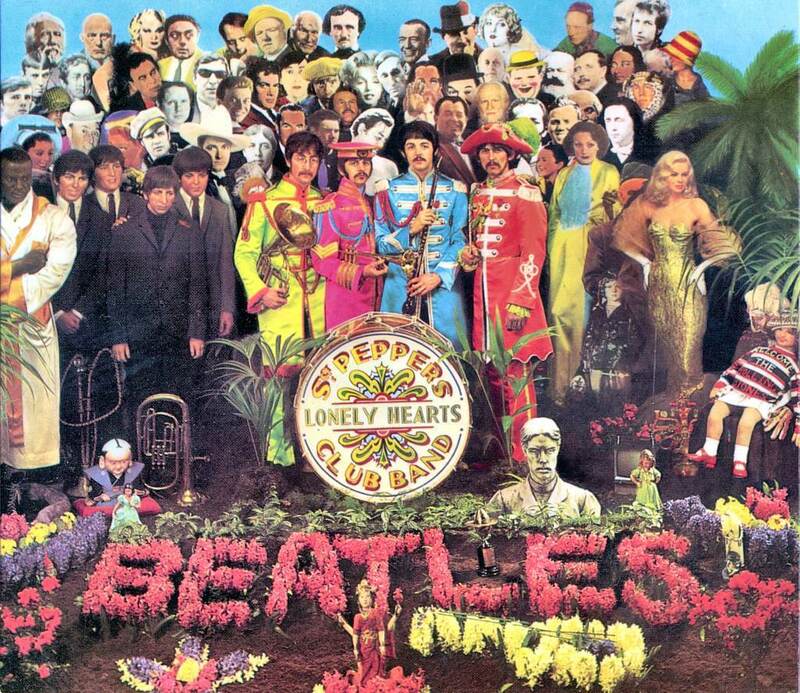 Pepper’s Lonely Hearts Club Band . Thus bringing to an end, the series of influential albums inspiring other greater albums. Yet, the album had one of the most strange influence on (once again) Brian Wilson, in the midst of a personal crisis, was again coming up with something to try and stake the claim for the top. But, listening to Strawberry Fields, was a crushing experience for him. After listening to Sgt Peppers, he gave up all his attempts to compete with The Beatles, a historic statement which remains true almost 45 years after it was made. Just check out, the most played artist on last.fm where after being briefly displaced from the top by Radiohead, they are back at top. You just have to move along. Into the break of dawn, shall we move on? Mumbai Indians – From my previous post to the current one, they have remained the team to beat. From the first match in which they revieved some royal treatment at the hands of Yusuf to the last one where they gave a drubbing to the royals from Bangalore. Sachin is continuing the dream run and there seem no real chances in near future of him stopping or slowing down. The rest of the batting probably their biggest concern is inexperienced and there’s quite a chance of them faltering if Sachin falls. Although the coming to form of Duminy & Pollard is a good sign for MI. Yet the main strength of mumbai after Sachin Tendulkar has been their bowling, the only team with more than 1 bowler in Purple cap race, they have 3 of them (Harbhajan, Malinga & Zaheer). Bhajji has been really good in the tournament with his containment job and also keeps picking up the wickets. Malinga the slinger has probably been the most difficult bowler to get away and Zaheer Khan has more than often been a handful at the top with his swing and at the death with those toe-crushers. Infact I will rmr the last MI-KKR match for the perfect toe-crusher Zaheer bowled to Chris Gayle. Royal Challengers Bangalore – Along with the MI, the only team which has shown some semblance of consistency, almost from the start of the tournament, when they were competing for the top spot with MI, they have looked like a sure shot Semis contender. The batting even with the old war horses Kallis (who has been a revealation this IPL), Dravis had enough fire power. Uthappa is probably the most destructive batsman of IPL, Manish Pandey though hasnt done much in this IPL but we all know what KP n Taylor can do to any team on their day while Kohli has been playing stable knocks whenever need. IPL has been a story of the captains, if Sachin has blown every team apart similar to the sand storm of ’98, Shane Warne has probably been the only reason why RR were in contention for Semis, Dada was always there to give his team a lift with a catch or a run out here and there and sometimes even batting well, similarly Kumble has perhaps been the one who wrote RCB’s success story last season and continuing it even further, he has that Jumbo influence on the game whenever he has the ball in hand or setting fields. Ofcourse it doesnt harm if you have got the best economy rate of the tournament. Steyn has left no stone unturned to cement his position as the best pacer in the world at the moment, the best thing about Steyn is, he doesnt need the short ball or the slower one (or other inventions of T20 bowling). His express pace and accuracy are more than often enough to strangulate batsmen. Praveen Kumar has also been more than handy many times while Vinay Kumar has been uprooting stumps with good frequency even earning him a national call. Deccan Chargers – Perhaps the most volatile of the 4 semi-finalists, have been having a dream run, requiring to win the last 5 games of the League stage to qualify for semis, they did it nice and easy with the help of ever dependant Rohit Sharma, ably supported by T Suman and Symonds at times. And yet the batting remains a big worry as for most parts, they are hugely dependent on Rohit to take them through, with other batsmen contributing very occassionally. Failure of Gilchrist & Gibbs have been the biggest challenge for them this season but knowing that how Gilly is a big match player, I wouldnt be really surprised if CSK are blown away by the storm that Gilly might create. While the batting of DC though unstable, has quality, the bowling doesnt really look that flattering. Pragyan Ojha has been the success story of this IPL, claiming the Purple cap from under the noses of many worthy competitors and hasnt let his hold of the cap go after he got it once. Chaminda Vaas has inspired confidence whenever he has played taking wickets up and down but he hasnt been a regular member of the squad but given the performance in the last match of league stage, it would be a brave man keeping him out of the squad. The bowling after this isnt much of a story, Symonds is there with his partnership breaking and containment job, but he would really not leave much mark if two well set batsmen are playing. Harmeet Singh is mostly an unknown identity who has bowled a few good overs in previous matches at crucial junctures. Wouldnt really bill them as the strongest contender but once you have reached the Semis, there’s just 2 matches left to win and it could be anyone’s day. Chennai Super Kings – The best thing about the team is, most of their victories have been courtesy different players, people have taken turns to shine in a match and the worst thing about the team is, nobody except Raina (who has been prolific in IPL yet again) and to an extent R. Ashwin (the tweaker) has been really consistent. There is nobody you can really count on in the team. Dhoni bludgeoned the KXIP yest, Hayden smote Delhi away with the Mongoose a few weeks back (after which he has done almost nothing), Murali Vijay was blistering hot against RR but hasnt done anything significant after that match. Bowling is one department of the game which has been Dhoni’s worry since the start of the tournament and by the end of the competition he is still sturggling in this regard, with Doug Bollinger providing some sort of hope to the captain Dhoni. Bollinger and Ashwin give the team 8 good overs but its the remaining 12 overs which have been the thorn in flesh of Dhoni’s men many a times in the tournament. Perhaps the biggest strength of Dhoni’s men which has taken them to a record 3 semis is the relatively young team which has come together quite nicely under the leadership of Dhoni, a sign of the Good Vibrations going on in the team were visible in the jubiliations after the match at Dharamshala. I personally would have loved to see a Mumbai VS Bangalore final,the most consistent teams of the tournament instead it would be the final berth that these two would be fighting for, while the other semi will be played between DC & CSK. So Hoping for the best team to win, in the final stages of perhaps the biggest drama India has seen where Dalai Lama and Cheerleaders go hand in hand along with Politics, Bollywood, some corruption a few DLF maximums, MRF Zepps, Citi Moments of success and where between all this drama, you get to see some of the most exciting and interesting cricket being played by players of highest quality. And this is where I sign out, wishing Sachin and his men all the best, after two Aussies lifting the trophy its His turn to lift the trohy this time round. Perhaps the driver’s heaven of all the cities I have been to and drove in. The new parts needless to say have good roads but even the not so new areas like Panjagutta, Secunderabad and likes have broad roads. That even these roads are packed at the peak time is nobody’s fault but that of the ever bludgeoning population.Hyderabad trafiic definitely is not one of the most disciplined and civilzed one in the country but yeah compared to many other cities I have been to, driving in Hyderabad is like bliss (specially again in the newer areas, if you are talking about areas Mehdipatnam onwards then spare me). Almost all the major roads are wide, have traffic signals which do work! Even areas around abids have, at times sufficient space where you can have a single rush of adrenaline. Hyderabad traffic police is, I would say the best of the lot. Neither are they too lenient like the Pune ones, neither all the time in your face like their Bangalorean counterparts. More than often its a matter of chance, you might get caught for a NOC or helmet and at other times you can come from HRC to madhapur 4 bottles drunk without being caught. As I would like to call it, the city of traffic jams, one ways, traffic singals, fines and dead ends, this line basically sums up my thoughts about Bangalore traffic and road.Everybody knows about the traffic jams of Bangalore, but coming from Hyderabad, I was amazed by the number of dead ends and one ways in Bangalore. I just seem to remember areas around Miyapur as the one which has dead ends otherwise we dont have many dead ends in Hyderabad, even one ways are too far and few to be encountered. Again, in Bangalore, at times you encounter trafiic signals at distances less than a kilometer. And that bangalore traffic is an impatient lot, is just a wrong notion,in front of Pune crowd, bangaloreans are quite a decent lot. The only good thing about Bangalore is, the traffic Police, with such a huge crowd hustling through those narrow streets, there needed to be something which can run it and Bangaloer traffic Police, as much as I hate it for fining me 900rs in the 3 days I spent there last time, is doing a good thing. People are actually not driving drunk in the night for the fear of the strict checking and the fine. I actually cant think what would have happened to Bangalore if this werent so. A city with absolutely no traffic sense, they still live in an era when Pune was perhaps not a metro. Helmets are rarely seen, I fear being ridiculed just because I am wearing a helmet in the city. Traffic lights at place like KP arent functional at 8 pm on a weekend night. And even when traffic lights are working, they hardly seem to have an effect on the spirits of people. An average puneite (whats the corresponding term for Pune?) generally leaves when the clock on the traffic signal shows 15 secs to being green. At times it was great fun to come, stand in the front on a traffic signal and not budge from my place until the light turns green. Havent been much in Pune to describe more about the roads and people, but roads in general werent too good. Woudlnt really call the roads we travelled on as good. Even the Airport Road is not good by standards of Airport Roads (although it doesnt help that the airport is in city). The best (?worst? )thing is again the traffic police, do anything you want, drink, smoke but they wont say anything to you in contrast to the omnipresent Bangalore police.